The zombie apocalypse has arrived so lock your doors and barricade your windows, or plant some sunflowers and pea shooters in your back yard and defend your honor. Plants versus zombies finally hit the Nintendo DS and yours truly had the honor of spending hours playing through this cult phenomenon. No title since the horrid Farmville has reached more people and become such a fixation for gamers everywhere. 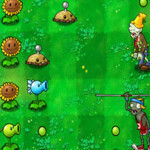 PvZ is one of the simpler tower defense games (should we call it a flower defense game?) but it also happens to be one of the most enjoyable ones on the market. 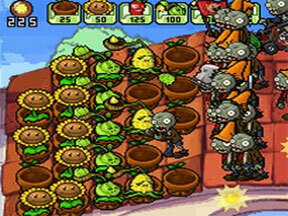 In case the players are a little rusty on PvZ then a short refresher course is in order. The dead have risen from the grave and are on a mission to eat the player’s brains, and the only thing standing in their way is the landscaping. Yes, the player’s army consists of 48 different plants whose sole purpose is to protect your coveted stamp collection and well your brains if they have time. The zombies are coming prepared though as the player must battle 26 different zombie types with everything from football gear and dolphins. To survive, the player must strategically choose and place their attack and defense plants. Although the game starts out very easy, it becomes more challenging as the player moves on. The game alters between the day and the night which really affects the plants that can be used. During the day the player harvests sunlight from the sun and sunflowers to supply the backyard with its royal guard. During the night time when no sunlight is available the player must use their sunflowers and specific mushrooms to keep the yard safe. Certain mushrooms are only available during the night, which makes those night campaigns much easier to accomplish. Although the plants are affected by the night time, the zombies are always well equipped and as the levels move on the zombies bring out more of their secret weapons. There is also a pool in some levels that require aquatic plants to counter things like the zombie swim team, zombies equipped with snorkels and the aforementioned undead zombie dolphin. So what are the differences between the beloved PC (and other) versions and the newly formatted DS game? There are new game modes added to the DS version that make this title even more enjoyable. First it’s important to know that these new features and modes are only accessible once the player has progressed to certain points in the story mode. Players can create their own zombitars by editing the hair, skin, clothing, jewelry, hats and more accessories. 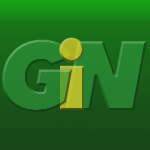 There is a multiplayer feature that allows players to skirmish with another player with the game or by download play. 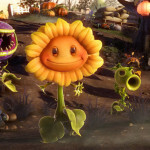 If multiplayer battles is not the number one choice, the player can instead play puzzle games, survival mode or mini games such as zombotany or wall-nut bowling. All the new mini-games are fun and will waste a lot of your time, which is a good thing. However, there are a few issues that PopCap should have paid a bit more attention to when developing this version for the DS, such as the use of the top screen, sound and the animation. The top screen has almost no function during the gameplay. It shows the zombie horde progression and a few zombies and crows, and there could have been a bit more detail to its function. Really, I just wanted to see more use of that top screen since that is the unique feature of this platform. The sound quality was also not very impressive and a better soundtrack could have really made this title pop. The only concern with the animation is there are much fewer frames of animation available with the DS’s processor, and as more zombies come on to the screen, the slowdown becomes much more noticeable. Having played this game on other platforms, I can say that the DS version does not run as well as the one for the iPhone or the PC version. But that said, it’s well worth the 20 dollar investment. The new game modes alone make this a must-have for any PvZ fan. Plants vs Zombies again provides players with hours of entertainment, and for around $20 it’s a smart investment. 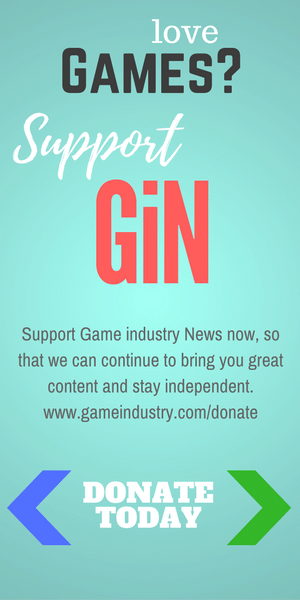 I give it 4.5 GiN Gems.